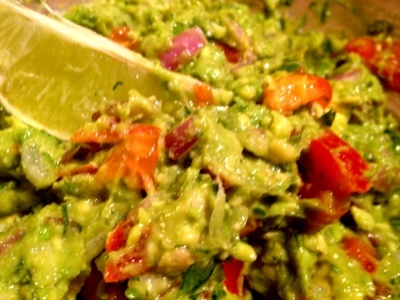 Who needs a recipe for guacamole right?! You'd be surprised how many people buy pre-made guacamole from the store. I have a major problem with sacrificing my bank account, and more importantly my taste buds for commercial grade guacamole (this soapbox rant also applies to hummus and salad dressing). Here's a quick guide to the perfect guacamole. No chips? Don't worry, I won't tell if you just whip out a spoon. It really is that good! Peel and pit the avocado, sprinkle with salt, and squirt some lime juice on the avocado halves. Use a fork and spoon to mash the avocado to your desired consistency. I know people who have to have their guacamole whipped; I like my guac chunky. Add remaining ingredients and fold into each other until well combined.